Fall layering was a huge trend seen on the runways from Burberry to Tibi, Simone Rocha, Max Mara and Gucci. Layering in a modern way showcases fashion-forward style pairing the unexpected together. While this trend isn't necessarily new, piecing together sweaters, dresses, tights, jackets, and blouses add depth and dimension to your look. Don't be left behind wearing jeans, a blouse and sweater...passe. 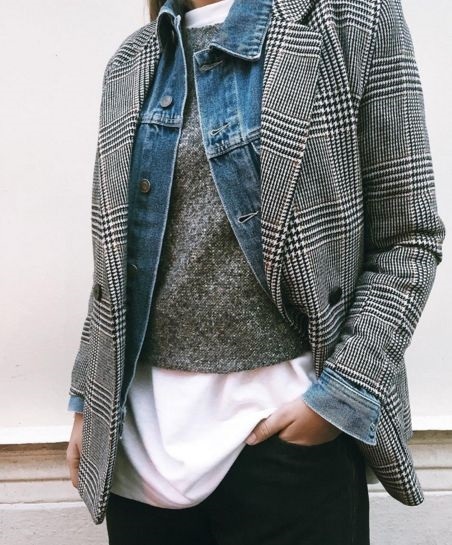 Luxe Layers on top, such as this look featuring a houndstooth blazer worn over a jean jacket, gray knit sweater and white long shirt. The various hemlines, 4 different textures all make this casual style truly stand out. If four pieces is too much, try layering a sweater with blouse underneath or camisole, and a print blazer to add depth. Rich knits and chunky sweaters make the perfect layering piece with flirty skirts or dresses. Pairing over the knee boots with a skirt gives fall texture and feel to the outfit. Opt for a monochromatic look in layers of cream, reds, blues for a modern twist. Draping a long dress with a rich blouse, turtleneck or velvet top is the perfect fall look paired with this season's hottest trend, the lace up boot. From tights to lace overlays, crossbody or belt bags all accentuate this fall style.